OSWEGO, NY – The weather is warmer and the grass is green; it’s time to add the United Way of Greater Oswego County’s annual golf tournament to your golf calendar! The annual United Way of Greater Oswego County Golf Tournament will be held July 10 at the Oswego Country Club. 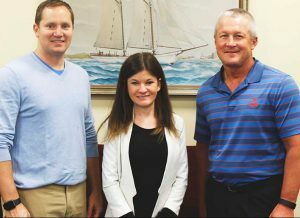 From left are planning committee chair John Nelson of Nelson Funeral Home, United Way Resource Development Director Ali McGrath and planning committee member Dave Lloyd of Novelis. Absent is committee member Lynn Eggert of Novelis. One of Central New York’s most anticipated and largest golf tournaments, the United Way’s tournament will be held July 10. It will once again be hosted by the county’s most prestigious private golf course, the Oswego County Club. Now in its 22nd year the United Way’s annual golf tournament has offered the opportunity for participating companies and community members to enjoy a fun day of golf while supporting one of the county’s most impactful agencies, the United Way. United Way Resource Development Director Ali McGrath said the planning committee is busy putting together another strong golf tournament with some new additions. “This year’s tournament will feature all the fun and on course challenges you’ve come to expect; longest and straightest drives, chipping and putting contests, and closest to the pin. To add to the on course fun there will be some new and exciting twists to the drawings, prizes, silent auction, the ‘goodie bags’ that each golfer receives, and other surprises,” said McGrath. The United Way golf tournament offers two flights of golf, an 8 a.m. tee off and a 2 p.m. tee off. Registration for all different team sponsorship levels for the four person captain and crew teams includes: golf cart, goodie bag, breakfast, snacks, and a chicken and steak lunch for the morning flight; Sandwiches, snacks and a chicken and steak dinner for the afternoon flight. Additional amenities may be included depending on sponsorship level. The United Way is pleased to see the returning support of its major sponsors. To date major sponsors of this year’s United Way golf tournament include Burritt Motors, Exelon Generation, National Grid and Novelis. McGrath added that there are opportunities available for those interested in being a part of the tournament including major sponsorships, corporate foursomes, food and beverage, and hole sponsorships. “The annual tournament is an ideal opportunity for golf enthusiasts of all skill levels to gather with friends to enjoy a round of golf on one of Central New York’s finest courses while helping to support their local United Way. It’s a great day of golf for a good cause,” said McGrath. The deadline for registration is June 23.